You do not have to be an adult to master the atlatl. 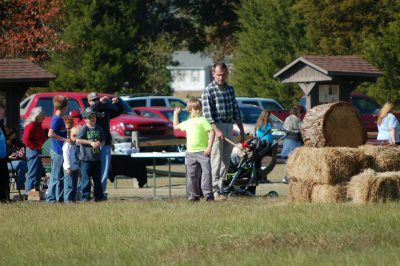 The annual Ingomar Mound Event is set this Saturday, Nov. 3, from 10 a.m. till 2 p.m. , weather permitting. Ingomar Mound site is located south of New Albany off Highway 15 on CR 96. The 2200 year old Ingomar Mound is Union County’s olders man-made structure. The out door event allows visitors a chance to tour the mounds, participate in hands- on activities and bring objects for identification by archaeologists from Cobb Institute. 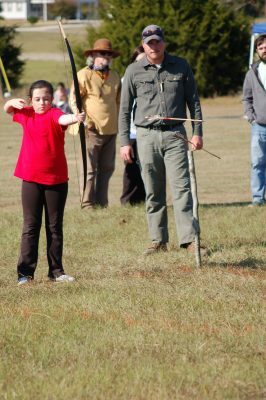 The annual atlatl competition will begin at 11 a.m. , registration will begin at 10:30. The atlatl is the ancient spear thrower, which was used during the Middle Woodland Period in which the Ingomar Mound site was built and occupied. It is one of the ancient weapons which visitors will have the opportunity to try on Saturday, said Jill Smith, Museum Director. There is an adult and youth component to the competition. Hands-on crafts and activities for children will also be a part of the event. Visitors will have the chance to use ancient weapons. The oldest manmade structure in Union County, the mound complex has been carbon dated to be constructed 2,200 years ago, according to research done by the late Dr. Janet Rafferty from Mississippi State University, who made this archaeological structure one of her main focuses of research and publications. The site is owed by the Archaeological Conservancy and is interpreted and maintained by the Union County Board of Supervisors and the Union County Heritage Museum. There are many hands-on experiences for visitors. The first historic record of the mound comes through letters written by the Rev. Samuel Agnew, who wrote the Smithsonian Institution to ask that the large site be studied. This communication took place circa 1865, and it is supposed that the Rev. Agnew passed the mound group often while visiting a church elder that then lived near the mounds. Agnew, who was a prolific writer, was pastor at Hopewell ARP Church for a period, as well as other ARP churches in the area. By the mid 1880s researchers from the American Bureau of Ethnology spent several months researching and mapping the site and removing artifacts from the 14 mound location. The Smithsonian now has much of these materials. The Union County Heritage Museum also has an exhibit which features objects from the early excavations. The event Saturday is free, made possible by the museum’s Community Partner Program. For more information call the museum at 662-538-0014.